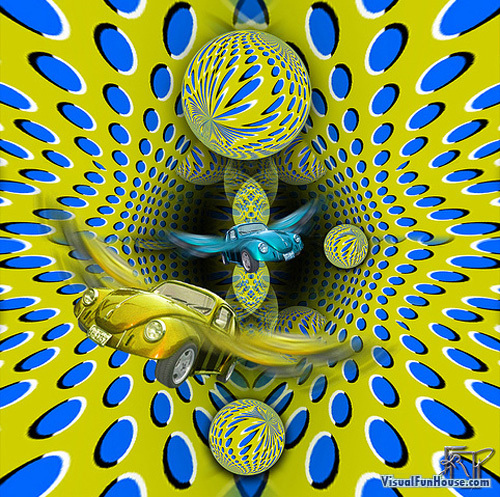 This awesome Optical Illusion is a new twist on some the old Spinning Tunnel Optical Illusion. The artist has turned that pattern into a vortex with some funky flying VB Beatles and mirror balls flying out of it. The image is a jpeg not an animated gif, which is part of what makes it an optical illusion! If you stare into the vortex it appears that the edges are sucking into itself. In actuality this is a static image and not moving at all, your eyes shift focus of the contrasted dot edges. This difference on contrast on the blue circles is what gives the illusion that the image is in motion. Ahahahahaha! It doesn’t work when I’m drunk! I looked at it earlier this afternoon at work, but now that I’ve had more than a few beers, this optic illusion doesn’t have an effect.